WILSONVILLE, OR--(Marketwired - Jun 25, 2015) - FLIR Systems, Inc. (NASDAQ: FLIR) today announced that the next generation FLIR ONE™ thermal imager is now available for purchase worldwide. With versions for both iOS and Android device platforms, the versatile and pocket-sized FLIR ONE transforms a mobile device into a powerful thermal imager that sees heat and accurately measures temperature. Providing users with the incredible ability to see temperature variations smaller than a tenth of a degree, the technology enables a host of practical applications, from identifying energy inefficiencies and water leaks in a home, to enabling safe and enjoyable outdoor exploration. The new FLIR ONE utilizes either a micro-USB connector for Android devices or a Lightening connector for iOS devices to offer a compact accessory that easily connects to a smartphone or tablet. The FLIR ONE is powered by an internal battery and utilizes FLIR's latest generation Lepton thermal camera core, which features four times the resolution of the previous version. Images are further enhanced with FLIR's patented multi-spectral dynamic imaging (MSX®) technology, which embosses the edge details from FLIR ONE's visible camera onto the thermal image producing high fidelity images. The "FLIR Certified Developer" program offers developers training in thermal imaging technology and the use of FLIR ONE developer tools. The "FLIR Approved Application" program offers developers publicity through FLIR marketing programs and the "FLIR Approved" distinction. "Last year, we successfully introduced the world to the FLIR ONE, the world's first thermal imaging accessory for a smartphone. This next generation FLIR ONE builds on this success by offering higher performance, broader compatibility, and a compelling value proposition," said Andy Teich, President and CEO of FLIR Systems. "And with the launch of our new application developer support programs, we expect to see new applications and use cases emerge for this new FLIR ONE platform." FLIR ONE, with an MSRP of $249.99, is available worldwide beginning today for iOS devices on FLIR.com/FLIRONE, with the Android-compatible version available in July. Roll-out at worldwide e-tailers and retailers will begin in July and continue throughout the second half of 2015. The first generation FLIR ONE for Apple's iPhone 5/5s platform is now available for $149.99. To learn more about FLIR ONE, visit www.flir.com/FLIRONE. For more information about the FLIR developer program, visit http://flir.com/flirone/developer. The statements in this release by Andy Teich and the other statements in this release about the product described above are forward-looking statements within the meaning of the Private Securities Litigation Reform Act of 1995. Such statements are based on current expectations, estimates, and projections about FLIR's business based, in part, on assumptions made by management. These statements are not guarantees of future performance and involve risks and uncertainties that are difficult to predict. Therefore, actual outcomes and results may differ materially from what is expressed or forecasted in such forward-looking statements due to numerous factors, including the following: the ability to manufacture and deliver the systems referenced in this release, changes in pricing of FLIR's products, changing demand for FLIR's products, product mix, the impact of competitive products and pricing, constraints on supplies of critical components, excess or shortage of production capacity, the ability of FLIR to manufacture and ship products in a timely manner, FLIR's continuing compliance with U.S. export control laws and regulations, and other risks discussed from time to time in FLIR's Securities and Exchange Commission filings and reports. In addition, such statements could be affected by general industry and market conditions and growth rates, and general domestic and international economic conditions. Such forward-looking statements speak only as of the date on which they are made and FLIR does not undertake any obligation to update any forward-looking statement to reflect events or circumstances after the date of this release, or for changes made to this document by wire services or Internet service providers. 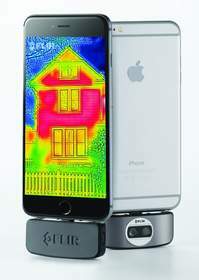 FLIR's higher-resolution plug-in accessory, shown here for the iPhone 6, offers broad compatibility with iOS and Android devices.